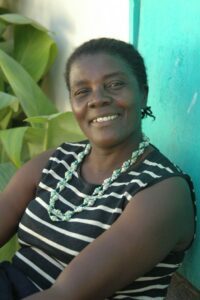 When Therese joined The Haitian Bead Project in the summer of 2012 she didn’t know exactly what she was getting into. She entered the one-room church building where the artisans meet greeting everyone with a smile. This mama of three children – one girl and two boys – has an adventurous spirit and is eager to try to new things. That showed right away. Therese was an active part of summer training sessions with visiting teachers like Dana Johnson. She watched carefully and quickly learned the technique to roll beads from recycled paper and string into bracelets, classic and layering necklaces. Not only did Therese develop her skills as a jewelry artisan, she also has formed friendships with the women in her group. They share problems, successes and even prayer requests as they gather each week to make beads. Therese expresses her desire to save money so all her kids can get an education and learn English. She wants to provide them hope for the future. She tries out some of the English she has learned: “Thank you,” she says flashing that signature smile.